A century ago, a very remark­able miracle took place in this country, that just now seems to be making the headlines. The people who witnessed it were very excited and jubilant indeed, but surprisingly little mention is made of it in any written form — and then only briefly; to me this is the mystery of the miracle. This miracle, how­ever, is still with us today for you to see, as I did. Perhaps it was meant to be its own witness, to stand the test of time and prove the worth of tradition. But what is this miracle? It is a beautiful wooden stairway that makes two complete circles as it rises gracefully and uni­formly in perfect symmetry. Amazingly, it has no center pole, as every other spiral stair­case has, for support. There are no nails or screws in any part of it, nor are there steel plates, angle irons nor anything else but wood and wooden pegs throughout. The curved string­ers, which hold the steps, bend in perfect circles as they rise to nearly twenty feet. They are solid boards two inches thick of a variety of fir not native to the place, but claimed by some to be found only in the Holy Land. The steps have been trod upon continuously in the past, yet show little wear. Carpenters and builders from all over the world are amazed that the whole structure did not collapse the first time someone stepped upon it. But I have seen a picture showing fifteen people walking down them at the same time. Another outstanding fact is that this masterpiece was built by just one man. And wit­nesses, present at the time of the construction, remarked that the only instruments he used were a hammer, a saw, a T-square, and a few other hand tools, all of which were kept in a small tool chest. And where is this marvelous stairway? In New Mexico, in the “Royal City of the Holy Faith of Saint Francis of Assisi” commonly called Santa Fe, in a Gothic chapel dedicated to Our Blessed Mother under the tile of “Our Lady of Light.” And most important of all, the people of this “City of Holy Faith” have always believed, and assure us even today, that the man who built this Miraculous Stairway was none other than the Prince of Carpenters, Saint Joseph. In 1978 I was fortunate to be among the Brothers who were sent to Santa Fe to distribute this Catholic Quarterly and to visit Our Lady of Light Chapel and to see the Miraculous Stair­way. Here in Still River, Massa­chusetts, we had just finished building our own chapel, which is a wooden structure ninety-two feet long by thirty feet wide. Therefore, having had this experience in carpentry and building, we were anxious not only to see the famous staircase, but also to take in every detail of the entire chapel. We learned on our visit that the Bishop of Santa Fe at the time the chapel was built was from France. It was his wish to have a chapel modeled after the famous shrine in Paris, La Sainte Chapelle built by King Saint Louis. And that is why the Chapel of Our Lady of Light is so clearly like the original. It is a tall and slender stone structure reaching eighty-five feet in height with buttresses evenly spaced against the walls. The red roof is sharply pitched and made of volcanic stone ob­tained from a nearby quarry. On the inside everything is lightsome, due to the large stained-glass windows. Partic­ularly striking is the beautiful rose window over the choir loft. And rising up to this choir loft is Saint Joseph’s masterpiece. But before we go any further, let us first prepare the way for Saint Joseph’s arrival in Santa Fe by giving a general view of some of the people, the times, and the circumstances which led up to such an outstanding event. The American flag was raised for the first time over the city of Santa Fe on August 18, 1846, when Major General Stephen Kearny peaceably captured the city from the rule of Mexico. Although the Faith had flourished in New Mexico since the coming of the first missionaries three hundred years ago, the Church at this time was in a sorry state owing to a great lack of priests. The Franciscans had been with­drawn in the 1830s, leaving only a few native priests to admin­ister to thousands of people, and among these were fewer still who remained loyal to their sacred calling. Yet, in spite of all, this frontier bishop would often travel on horseback over mountains and across deserts with just one com­panion, “exposed to the arrows” of such Indians as the fierce Apache, Comanche, or the most fierce Kiowas. One visible blessing was his meeting the renowned priest of the Society of Jesus, Father Pierre de Smet, known as “The Blackrobe” to every Indian nation in the Northwest, from Saint Louis to the Pacific. This apostle to the Indians had long been a veteran in the hard ways of the West when the two first met in Saint Louis. Each recog­nized in the other the same enthusiastic and perhaps reck­less spirit of self-sacrifice to save souls, and they became fast friends. Father de Smet proved invaluable not only by his ad­vice, but by taking upon himself all practical business negotia­tions and transactions of the bishop. 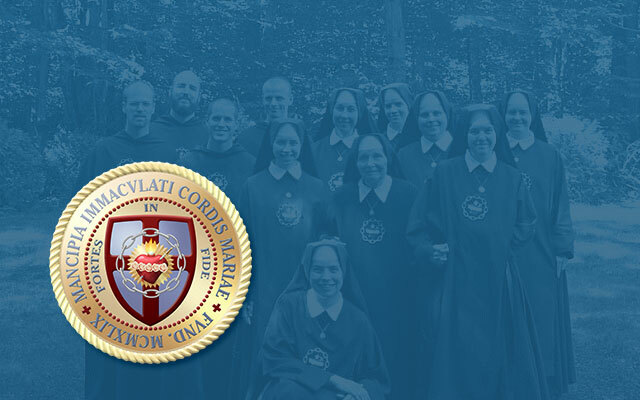 Yet perhaps the most visible blessing granted by Divine Providence on this archdiocese was the coming of the Sisters of Loretto, for whom Saint Joseph would eventually perform such a unique miracle. Preceding their coming, Bishop Lamy went back East looking for Sisters to teach in his schools. He went to many places but without success. Finally he made a petition to the “Sisters of Loretto at the Foot of the Cross” — the first religious institute of American origin. This order was founded by the “Apostle of Kentucky,” Father Charles Nerinx, who in­cidentally was also responsible for inspiring Father de Smet to come to America. Six Sisters were chosen, and they set out bravely on June 27, 1852. If the devil had had his way, they never would have reached their destination, due to the obstacles he placed in their path. One thing is certain: their title, “at the Foot of the Cross,” is no empty one, for during the next three months they suffered in every imagina­ble way. Three Sisters fell sick from the cholera and one of these, the superior of the little band, died. Another had to be left behind. Finally, on Septem­ber 26 the remaining four Sisters made their entry into Santa Fe amid the joyful shouts of the whole town. During her twenty-nine years in office, ten branch foundations were successfully established from this community — eight in New Mexico, one in Colorado and one in Texas — thus pro­viding thousands of children with a Catholic education. In short, no written word can ever tell the real story of the good accomplished by these dedicated Sisters. Most important to our story, however, is that Mother Mag­dalen was responsible for the construction of the Chapel of Our Lady of Light. Work was begun in 1873 and the chapel was finished and dedicated on April 25, 1878. The Sisters, hav­ing saved what they could over the past twenty-one years from tuitions, were able to pay the entire cost of $30,000. Enthu­siastically supporting the whole project was Bishop Lamy, who was often seen on the site serv­ing lunch to the Mexican workers. The architect was Projectus Mouly, who had come from France with his father, Antoine Mouly, at the Bishop’s request that they design and build his cathedral. Antoine was going blind, money was scarce, and work on the cathedral had come to a halt. Mother Magdalen, therefore, took this opportunity to engage the service of Projec­tus for the chapel. Sister Blandina was very sympathetic with Mother Mag­dalen over the loss of the architect, and more than once asked Monsieur Mouly to return to the work, but it was of no avail. Per­haps his leaving explains how plans for a stairway to the choir loft were overlooked. For mean­while, the work went on without him and it wasn’t until the chapel was almost completed that the omission was dis­covered. The Sisters, on first hearing of this, couldn’t understand why it was considered such a problem. 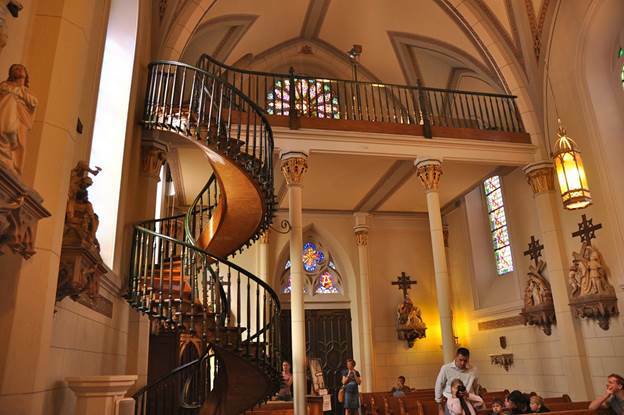 Someone then explained that since the choir loft was so high, a conventional staircase would extend far into the chapel, tak­ing up too much room and spoil­ing the beauty of the interior. The carpenters after much con­sideration came up with a drastic solution. “There is nothing else to do,” they said, “but rip down the loft and rebuild it considerably lower.” But the Sisters would not hear of such a thing. From the very beginning of its construction, the chapel had been placed under the care of Saint Joseph “in whose honor we communicated every Wednesday (Wednesday is dedicated by the Church to Saint Joseph) that he might assist us,” wrote Mother Magdalen. She then adds, “Of his powerful help we have been witnesses on several occasions.” So immediately they began a Novena to their heavenly patron. Perhaps they promised to name their next school in his honor, for the records show that in 1879, one year after the dedication of the chapel, they founded “Saint Joseph’s School” in Taos. The reports of Saint Joseph’s actual arrival and building of the spiral staircase have come down to us through tradition, which Sister Barbour assures us began at the same time as the event. There are a few particular details that vary, but generally the accounts run along the same lines. All agree that on the last day of the Novena a gray-haired man leading a donkey bearing a tool chest arrived at the con­vent gate and asked to see the superior. He explained to Mother Magdalen that he was a carpenter by trade, and would like to volunteer his services in building the much needed stair­case. She was only too eager to accept his offer, but failed to ask his name or where he was from. Going to the chapel, he pointed out where he could make a set of stairs, and how they would be built so as not to take up much space. Having done this, he dili­gently set to work. Some say that he completed the staircase overnight. But according to the Sisters present at the time, it took considerably longer. They recalled seeing tubs of water with wood soaking in them. This would explain how the wood was bent and adds to the probability that the actual building time took several months. It is also from the Sisters that we learn that the very simplest of tools were used. “I was fortunate to go to Mass every day for four years while I was in high school at Loretto Academy for girls. The famous staircase did not have a rail at the time, but one was added later for safety. To help preserve the stairs, we were allowed to go up to the choir loft only one at a time. From this account we can see today that the lively faith of the people of Santa Fe of Mexican descent has remained un­changed since the time Our Lady appeared at Guadalupe in Mexico in 1531. And many of the Sisters of Loretto have also believed that Saint Joseph him­self built these stairs. And why not? Does not the unknown carpenter fit the description of the Saint Joseph we know from Holy Scripture and tradition? He came to Santa Fe as he lived on earth two thousand years ago, a silent stranger known only as a carpenter. It wasn’t until he was gone that he was recognized as Saint Joseph, a “son of David” and, therefore, a king, the chaste spouse of the Blessed Virgin and foster father of Our Lord. Today, then , let us not fail to recognize him as our patron and intercessor in his unchanged position as “Head of the Holy Family.” Have you a need? “Go to Joseph” as the Sisters of Lo­retto did, and see what happens!